Are you local? Many of these are available to purchase at Burlington By the Book on Jefferson Street in Downtown Burlington. 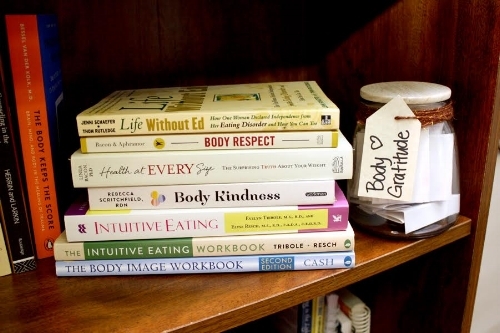 Please note: some books, especially on eating disorders, may be triggering for some individuals. Please contact me or a clinician you are working with if you are worried about triggers from self-help books. I am happy to be a resource for your food and body image healing. Sign up with your email address to receive inspiration, news and updates.